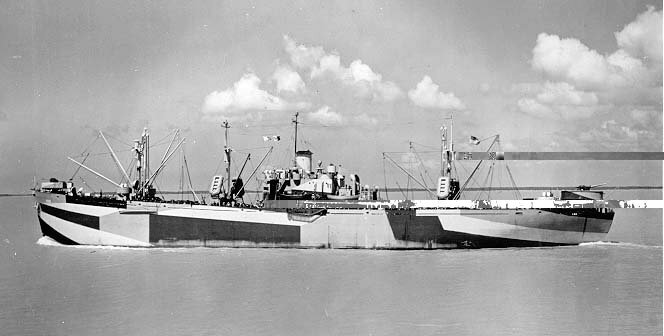 Laid down, 4 December 1943, under Maritime Commission contract (MC hull 2449) at Delta Shipbuilding Corp., New Orleans, LA. Converted for Naval service at Alabama Shipbuilding & Drydock Co., Mobile, AL. Decommissioned, 2 January 1946, at Norfolk, VA. Returned to the Maritime Commission, 11 January 1946, for lay up in the National Defense Reserve Fleet, James River, Lee Hall, VA.
two recip-drive 60 Kw 120V D.C.
35k USS Arkab (AK-130) under way, date and location unknown. Her camouflage is Measure 33 Design 9D.